Returning for their 7th year were John & Monica Ziegler from Union Hall, VA. John fishing alone, on his 1st day had a good day fishing for Smallmouth Bass, had fast action on Northern after some rain moved in which kept John very busy with two of the pike being over 30” & one measured 34”. 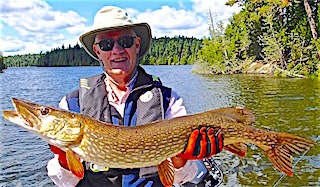 2nd day after a slower start John had the Pike turn on catching one after another using a slow swim presentation with a Storm Wild eye Shad. 4th day John caught 7 Northern Pike and 3 Smallmouth Bass. 5th day & 6th days John caught some nice Northern Pike & Smallmouth Bass enjoying every minute of his time on the water. Before departing both John & Monica mentioned that their son & his wife Crystal want to return with them in 2017 as they did in 2015. Long time guests Paul Letourneau from North Oaks, MN, returning for his second time in 2016, was with Spencer Olson from Minneapolis, MN. 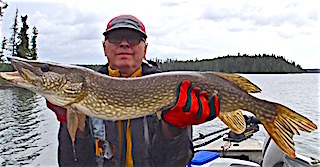 1st full day on the water was BIG for Spencer as he caught a absolute GIANT Trophy 43-inch Northern Pike on an ultra lite rod with a 3-inch hand made lure from a personal friend, Otto Muikku, who is a lure maker in Finland. 2nd day they caught some nice Northern Pike including two over 30” and one at 35”, plus several Smallmouth Bass. 3rd day had them catching Pike with two over 30”. 3rd day was very similar to the 2nd. 4th day they did well on Northern Pike and Spencer caught a nice Muskie. The real story here was that Spencer & his wife have a cabin in Finland and knows a custom lure maker Otto Muikku. Well Otto wanted to know how his lures preformed in Canada so he let Spencer use some of his handcrafted lures made from balsa wood. 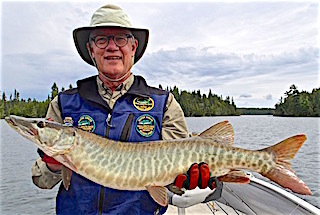 Guess what he caught his Muskie on, Otto’s lure, plus he has been catching most of his fish on these lures including the 43-inch Northern Pike mentioned above. 5th day was a portage adventure having fun catching Northern Pike then fished on Little Vermilion Lake to continue to catch some larger Pike. 6th & final day had them catching more Pike and chasing Muskie, with Spencer losing a 37-38” by a leader failure, Paul landed a 33-incher and they had a 40”plus up to the boat a half dozen times, with Paul hooking it once, but lost it after the fish got slack as it charged the boat at lighting speed. That concluded another fun Fireside Lodge fishing experience. Bryan Neel with Tim Stewart from Rochester, MN were back for their traditional 2nd trip within the same season, and for the 14th consecutive year. 1st day these two knocked it out of the park catching over 30 Northern Pike up to 35”, a Tiger Muskie, plus Tim landed a HUGE 45.5-inch Trophy Muskie. 2nd day was another good day Northern Pike fishing catching over 30. 3rd day was another great Northern Pike fishing day catching over 30, plus they got into a bunch of nice Smallmouth Bass 16 to 18 inches & Bryan caught an 18.5-inch Trophy Smallmouth Bass, however the biggest catch was by Tim as he landed a GIANT Trophy Muskie measuring 49-inches without compressing the tail. 4th day had them catching 35+ Northern Pike, some 35-38”, plus 6 Smallmouth Bass with three 18-19 inches. 5th day had them catching 27 Northern Pike. 6th day they caught 16 Northern Pike and several Smallmouth Bass between 17 to 18.5”. 7th & final day they finished by catching some nice Northern Pike and their parting words were we will see you in the spring of 2017. Previous guests from 1996 were father & two sons Dave Sr, Dave, & Doug Anewalt from Greensburg, IN returned to visit us at Fireside Lodge. First 3 days they portaged to three different lakes catching Northern Pike, landing over 20 in a day, and chasing Muskie one of these days. 4th day they had a great day catching some fish and Dave Sr hooked a huge Muskie near Twin Falls area and they all watched this Muskie just spit out Dave’s lure. They also had a fun shore lunch over an open fire and it was an all around wonderful day between father & sons. At supper that evening Dave Sr turned to me and asked where could we catch 40+ Pike tomorrow. I gave him an answer and that’s where they headed on day 5 not to catch 40 but 50 Northern Pike plus Dave Sr & Doug both landed Master Anglers Award Smallmouth Bass, Doug with an 18” & Dave Sr caught a 19”. They all said it was a fantastic day. 6th & final day they searched for Muskie until just before noon then switched to Northern Pike catching over 20. All remarked what a wonderful time they had spending quality father & son time together in our wilderness setting at Fireside Lodge. Long time 10-year guests, brothers Steve & Lawrence Sandler from the Greater Toronto Area arrived pumped and very glad to be back. DOA Steve set the bar catching a BIG 35” Northern Pike with very heavy girth. 1st day was great catching many Northern Pike before supper and after focusing on Smallmouth Bass catching several. 2nd day was another good day catching a mix of Northern Pike & Smallmouth Bass and Lawrence caught fish right away on a Polish Shad I sold to him that morning. 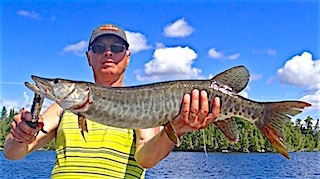 3rd day was exceptional starting out by Lawrence hooking into several big Muskie but losing them on the jump. Then they changed locations and caught a whole bunch of Pike and at the end of they day they got into a flurry of BIG Smallmouth Bass 17.5 to 19-inches surface fishing. Lawrence, before this experience, was not so hot on fishing for Smallmouth Bass but after this night I believe he is a convert forever. 4th and final day was full of action on Northern Pike, but the real fun came later when the winds calmed and the Torpedo’s came out. They again had a blast getting blow ups, hooking and loosing Smallmouth Bass and catching about 8 that would qualify as Trophy Smallmouth Bass 18-19.5-inches. They left making some great memories between brothers and definitely hooked on Surface fishing for Smallmouth Bass. Father & Son Richard Sr & Richard Nagengast from Woodway, TX & Dorr, MI, were visiting us at Fireside Lodge for their 1st time. DOA in just s few hours Rich landed a big 36-inch Northern Pike and a nice Walleye. 1st day they caught some Pike as they learned the lower end of Little Vermilion Lake. 2nd day they did very well trolling, catching Northern Pike with Rich Sr landing his 1st Muskie ever and caught a big Northern Pike. 3rd day these two did great catching many Northern Pike searching for that Trophy Muskie. 4th day they caught 40+ Northern Pike and when I saw Rich Sr walking up to the lodge from the dock he turned to me and said he was plain tired of catching fish. They left having had a wonderful time making lifetime memories between father & son. 18-Consecutive Year Guest Walt LaCasse, Waysata, MN returned for his 2nd trip with us this year with Grandson Keeghan (14) for their 8th trip together. DOA they caught some Pike up to 33” and Keeghan caught a Trophy 18-inch Smallmouth Bass. 1st day their morning was excellent catching 14 Northern Pike, but after the sky cleared the fishing slowed catching only a few in the afternoon and picked up 6 after supper. 2nd day was full of fast action catching over 40 Northern Pike. 3rd day had these two catching 12 Northern Pike 6 Smallmouth Bass and Keeghan caught a nice Muskie. After supper fishing was cancelled because of T-Storms. 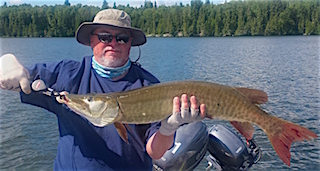 4th and final day they seemed to catch Smallmouth Bass wherever they were fishing for Northern Pike, and Keegahn lost a HUGE Trophy Smallmouth Bass plus they caught some nice Northern Pike and Walt landed a 36-inch Muskie. All good things come to an end but not without making another set of wonderful Grandfather / Grandson Fishing memories together and before departing Walt made their reservations for 2017. The Woodhams, Terry / Larry from Blackhawk & Irvine, CA and Bill from Mattawan, MI were making their 2nd appearance at Fireside Lodge. 1st day was GREAT catching numbers of Smallmouth Bass and 30 Northern Pike with some Pike in the 30-35” range. 2nd day was terrific catching over 50 Northern Pike. 3rd day seemed to be more focused on Muskie but they continued to catch Pike and Bill broke the ice catching the 1st Muskie of the trip. 4th and final day was a bit slower however they still caught some nice Northern Pike. All left having a GREAT time fishing, making wonderful memories, and catching up as brothers. Thanks for choosing Fireside Lodge to spend this valuable time together. Long time guest since 1993 Tony Majcher from Hawthorn Woods, IL was glad to be back. 1st day he caught 5 Smallmouth bass and 3 Pike. 2nd day by 9:30 AM he had 7 SB on and landed 4 including an 18” Trophy and caught a total of 10 Smallmouth Bass. 3rd day was met with heavy rain and a cold front but Tony still caught a few Smallmouth Bass and some Pike. 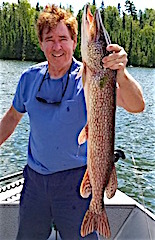 4th day was all about Northern Pike catching many and loosing a lot of plastic grubs on bite offs by Pike while fishing for Smallmouth Bass. Ironically the Woodhams brothers (above) met Tony on their last trip and invited him to there table to eat with them, so when I walked into the dinning room there was Tony sitting with Terry, Larry, & Bill enjoying a meal together. I guest you can consider Tony their Fireside adopted brother. 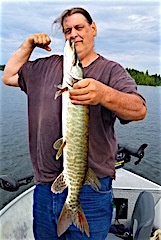 5th day & 6th days the Bass fishing was spotty just catching a few but Tony also caught some Northern Pike and a beauty of a Tiger Muskie. Tony left saying he had a great trip.